Good evening everyone! It is day 2 of the designer challenge. I decided to have a go at a second card using the Butterfly Pivot die. I decided to try using a backing behind the pivot. Although it can totally be used without it, it is fun changing up the look. Make sure to check out the other blogs and the Karen Burniston designer Facebook page for more inspiration. This month for the Karen Burniston Pop It Ups designers challenge, the word is "fly". We could choose to interpret the challenge any way we wanted. So here my challenge card using the Katie Label Pivot die. The stamp is from Art Impression and has been colored up with my Spectrum Noir markers. Stop by and check out all of the clever cards from the other challenge designers blogs to see how they "fly". Hello everyone! 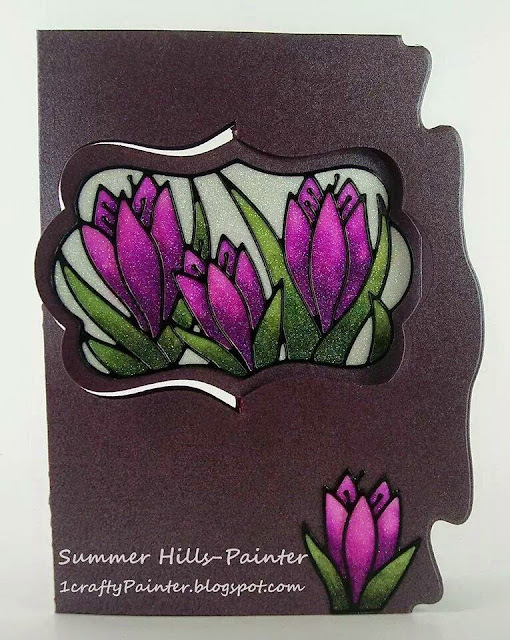 Today I am showing you how using the same supplies, you can get two totally different cards. Here I have used the Katie Label Pivot die with the coordinating peel offs from Elizabeth Craft Designs. I have used the Cool Diamond Glitter with the double sided adhesive. I colored the glitter using my Spectrum Noir markers and Inktense Pencils. The edges were die cut with the Agatha Edges die set.